An arts organisation in West Cumbria is improving the life skills, independence and confidence of young disabled people through a vibrant person-centred theatre programme. Prism Arts received £3,775 from the Live the Dream Fund towards their Studio Theatre programme – the only arts opportunity for young people and adults aged 13-25 with additional learning needs in West Cumbria. Already a success in Carlisle, the theatre project looks to increase and develop the wellbeing, aspirations, and integration of young disabled people into the local community. Weekly workshops are held every Wednesday during term time at the Kirkgate Centre in Cockermouth. Led by experienced professional artists and support workers, participants learn a range of creative skills including filmmaking, drama, movement, visual arts, and music. 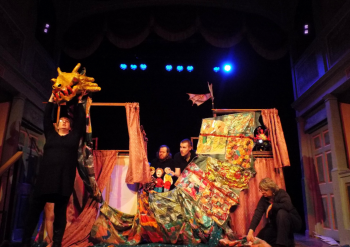 Over the summer, the group worked with Haltwhistle Film Project to create an animation of ‘Dragon’s Lantern’, which was shown at Cockermouth Live, C-Art, and Haig Pit Mining Museum (part of Rosehill Theatre BBC Ten Pieces Celebration). In charge of the work from the outset, the young people designed and created their own unique work for the performance. 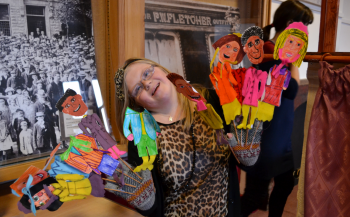 Katy has Down’s Syndrome and has been engaging with Prism Arts since she was 14. She is a very articulate, energetic young woman and wants to be a professional dancer. Prism Arts is the first arts organisation in Cumbria to develop sustainable opportunities funded by direct payments and personal budgets. However the project needed time to attract more participants to break even. The grant from the Live the Dream Fund ensured the project continued between April and July 2015 and avoided a gap in service for young people already taking part.